A CSA is basically a partnership between the farmer and the community, where the community commits to purchasing a significant portion of their seasonal food directly from the farm, while the farmer commits to growing a diversity of produce, eggs and pastured meat throughout the season. In becoming a member of the farm, you purchase a share in advance for the entire growing season, becoming a ‘shareholder’. We the farmers at Mountain Harvest, in turn, commit to growing a variety of vegetables for weekly delivery and raising pastured meat. From mid May to mid November you will be provided with freshly harvested produce from our fields and/or pastured meat. The bounty will vary from week to week, and month to month, depending on the season. This summer share features 12 different crop faimilies.Can you find them? 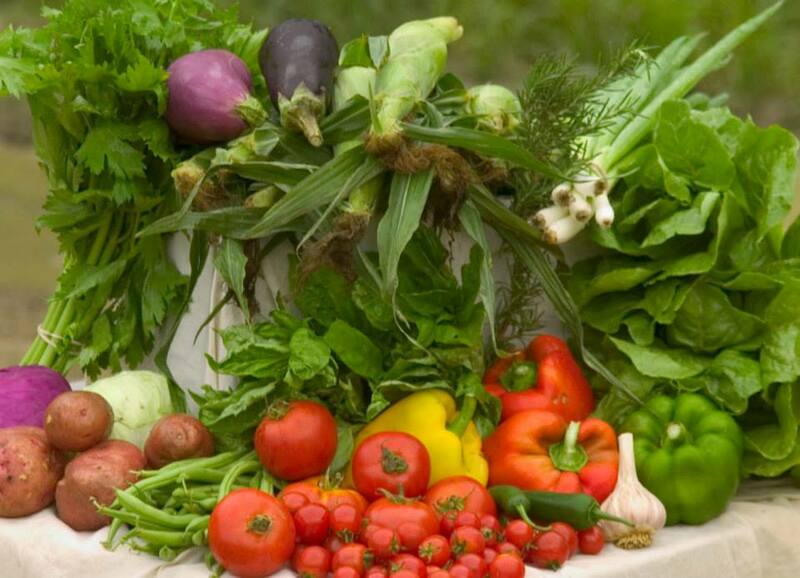 Why join a CSA, but especially Mountain Harvest Organics CSA? We offer a wide diversity throughout the season! We grow over 200 cultivars of vegetables, and using season extension techniques with 5 greenhouses in production, we are able to extend the harvest for those especially favorite crops such as tomatoes, peppers and beans.In addition, you may combine produce and our pastured meat with your order. Why become a member of a CSA? In purchasing your weekly food directly from the farm, you are supporting local agriculture, land preservation, and making a positive contribution to curbing climate change. Food shipped across the country is very energy intensive and creates a lot of carbon emissionsso it is good to limit the amount of food purchsed from abroad. You are able to enjoy ultra fresh produce because it is grown for the shareholder then harvested weekly at the peak of ripeness. The shareholder is exposed to new vegetables and new ways of cooking as members exchange recipes and cooking techniques. The shareholder becomes connected to the farm, the land where their food is grown and to the farmers who grow and harvest their food. The shareholder learns to eat with the seasons when subscribing to a CSA. One won’t find tomatoes in your share in May nor will you find many greens in your share mid summer! Sharing the risk with the farmer. Occasionally a farmer may experience a crop failure due to weather, pests or disease. The member will also experience this crop failure by not having the expected amount of produce delivered. When the farmer has an abundant harvest, the shareholder reaps the benefit by having a extra produce for great feasts, preserving or sharing with friends. A Season of Farmer’s Choice Shares! How much does a subscription cost and how does it work? How Much Can I expect the CSA to cost annually? Our CSA works differently than most. No pre-payment is necessary, simply go online and place your order weekly using our online store, and either pay using your credit-card when you check out or choose “Cash on Delivery” and pay when you pick-up. You simply pay weekly based on what you order! Our prices are similar to what you would pay for Organic Produce from either Earthfare or the French Broad Co-op. $600 @ $25/week for the Farmer’s Choice. $375 @ $25/week for the Farmer’s Choice. How will the CSA Work? Your place your order weekly, then it will be harvested and packed and available for pick-up Saturday’s at either the farm or the North Asheville Tailgate Market. Each Tuesday or Wednesday you will receive an eNewsletter alerting you that the availability in the online store has been updated.The newsletter also describes new produce available that week along with recipes, and the happenings on the farm. Once you receive your weekly eNewsletter, you will use the online store,and select the items that you wish for your share, and check-out. You may order the Farmer’s Choice, custom order a combination of vegetables and meat, the choice is yours! You should receive an order confirmation once you’ve checked out. Otherwise, please contact us because internet connections in rural america aren’t always relilable. Each Friday we will harvest and pack your order for pick-up Saturday at the Farm or the North Asheville Tailgate Market. We do know that many of you like the surprise and challenge in receiving a traditional CSA Share each week, so for those who prefer this style of CSA, you will have the option of purchase the Farmer’s Choice share from the online store.You also have the choice of creating a “custom share” by ordering individual items from the online store.In fact, you can combine the Farmer’s Choice and selected items from the online store. The advantages for the shareholder is that you won’t be required to order each week, Not only will this type of CSA offer the shareholder a more flexible schedule, but it will allow for the farm to set a cap on the amount of hours spent on production, allowing us to move towards building the farm vacation rental cabin. Payment options – We accept credit cards, cash or checks. What can I expect in my share throughout the season? These estimates are for those who choose to order the “Farmer’s Choice”. If you plan on choosing your weekly produce from our online store, you may use the below chart in understanding when produce is available. You can know when produce is available during the season when you see an entry on the chart for the vegetable. 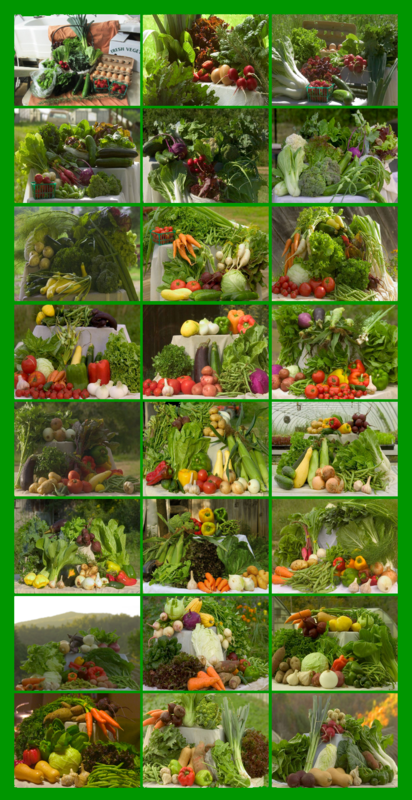 If we have not included any of your favorite vegetables, please let us know and perhaps we can grow it. This table depicts what will be delivered sometime during the season (Spring, Summer and Fall). Not all crops will be available every week during the season. For example, peppers normally don’t ripen until early August so they won’t be included in the early Summer deliveries. Our spring shares are smaller than summer/fall shares so please take this into consideration when establishing the budget for your groceries. NOTE: The estimates below are an approximation. Weather conditions and damage from animals can affect the availability of the crops. ∗ Means we are alternating between varieties listed. ⊕ Means this is a specialty crop and included in the share periodically throughout the season. Please contact us because normally the CSA fills up quickly! We deliver from mid May through December, and sometimes into January depending on the availability of overwintered greens and storage crops. To inquire about joining our CSA, or being added to our waiting list, please complete the contact us form.To catch our attention, It is best to enter “CSA Inquiry” in the subject. Please expect us to get back with you once we have received your message.